Mica has library check out once a week. He's checked out Green Eggs and Ham By: Dr Seuss twice. Guess who owns this book? We do. He must really like the story of Sam, Sam-I-am. 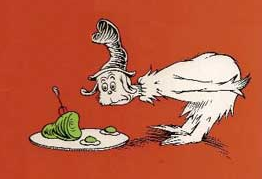 When my Daughter was young, she made me make her Green Eggs And Ham. I can't remember if she ate it though. I wonder if this comment will go through.